People tell me all the time, “Oh, I am not at all creative” or “I don’t have a creative bone in my body.” Well, personally, I would not want any of my bones trying something new or different, so I am okay with non-creative bones. However, I beg to differ about the first statement because every single person alive has the ability to be creative. We use this ability all the time, probably without even realizing it. Here is an example. 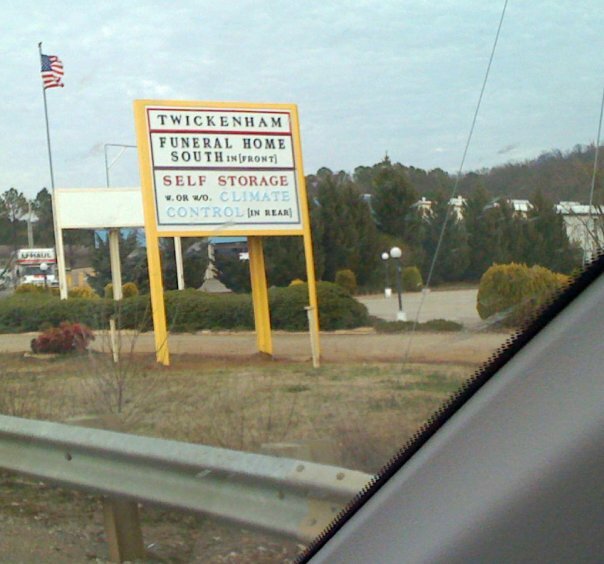 A few years ago in South Huntsville, there was a business called Twickenham Funeral Home. It was located just across the street from Walmart on a pretty busy section of Memorial Parkway. As we drove by there one day, I noticed that there was a large marquee in front of the building and in addition to TWICKENHAM FUNERAL HOME SOUTH it had these words: SELF STORAGE. And, in an effort to be very clear, it also had this: “FUNERAL HOME IN [FRONT], SELF STORAGE [IN BACK]“. AND, apparently, you can store yourself with or without climate control. (I’d opt for the climate control. You know how humid our Southern summers can be). If you envisioned even one potential scenario, you were just being creative. Certainly the existence of this hybrid business was an example of extremely creative thinking. I can see where the idea came from; they must have heard many of their clients pondering about what to do with their loved one’s belongings, and in an effort to offer more help, convenience and cash flow they added storage to their services. They were engaging creativity to increase business. Not that it worked because they are closed now*. The point is, though, they tried something different. CREATIVITY IS JUST NEW WAYS OF ARRANGING OLD BITS AND PIECES. I had that on a sign in my office years ago. It reminded me that being creative does not mean always coming up with an idea no one has ever thought of. Creativity is more about the approach to something. It is a way of looking at a challenge or question or problem, and deciding to find your own solution to it. The solution may not be earth shattering; it may just be different. The point is, what comes from your mind, will be the result of your own mind set, your way of looking at things, your experiences in life, your perspective. And that makes the idea a product of your creativity. Bad news: sadly, the funeral home and self storage business did not make it. Good news: I did get a photo of the sign. *Next time, I’ll be posting about how to make your creativity work for you…and not against.